Arunachal Chief Minister Pema Khandu expressed deep shock and sorrow over the loss of several lives at Modirijo and Donyi-polo area of Capital complex due to landslide this morning. 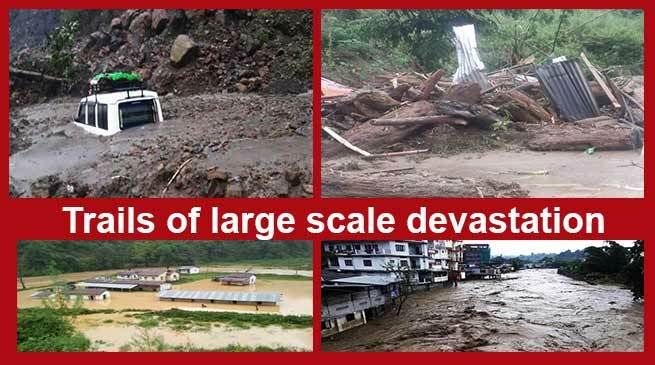 Incessant rain for last couple of days that triggered landslides and flood have left trails of large scale devastation in the capital region. Two human casualty including a minor has been reported as of now. While three went missing for which search and rescue operation is underway, two persons were retrieved and are undergoing treatment. Conveying his heartfelt condolences to the bereaved family members that fell prey to the nature’s fury, Khandu said that the State and its people are with the victims during this trying times. He announced immediate release of ex-gratia of Rs. 4 lakhs each to next of kins of the deceased and prayed for early recovery of those recuperating in the hospitals. Reportedly 12 houses have been fully washed away while 8 houses were damaged partially in Modirijo and 5 houses fully damaged and 4 partially damaged in Donyi Polo area by the landslide and flood. Few cars and bikes have also been reportedly swept away in the flooded river. Approach road to Modirijo has been completely washed away while half of the culvert has been reported to be damaged in Donyi polo area. A team of officers led by DC capital with Police, Disaster Management officers and others visited all major affected sites like Modirijo, Chandernagar, Lobi, Donyi Polo, GSS Police colony etc. to assess the situation. Water supply lines to capital region have also been reportedly badly affected by the incessant rain triggered landslide and flood.